Audrey C Gates is a certified American Tribal Style® (ATS®) dance teacher and a FatChanceBellyDance® Sister Studio based in Sandpoint, ID. 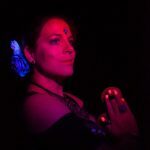 She began her journey in tribal style belly dance in September 2014 and quickly found her way to ATS® classes taught by Jessica Tingley of Devotion Tribal Bellydance. She received her General Skills certification in Texas in November 2015 and again in January 2017 in San Francisco where she also received her Teacher Training. She continuously takes classes from other certified ATS® instructors in the area, cultivating her love for the dance in its form, posture, and community, and her love for lifelong learning. She currently studies under Courtney Rowland of Spokane, Washington. Audrey is available for private lessons.